Using AWS, our upload and download speeds are up to 17 times faster compared to our old data centers, and our uptime has increased by orders of magnitude. Hightail enables extended teams of marketers, creatives, external agencies, and freelancers to collaborate effectively on visual content, accelerating creative review and approval cycles with intuitive and accessible tools. Additionally, the company has customers spread out across the globe, from North America to Australia. Setting up a data center in a new region typically took two full quarters, limiting the pace of growth Hightail could achieve. It wanted to be able to scale up in any given region quickly while providing high-performance services close to users. Hightail needed a storage solution that was both tiered and highly scalable. Because its customers collaborate on large files such as images, videos, PDFs, and presentations, Hightail had multiple petabytes of stored content to migrate. However, much of that content was not actively used by customers. The company hoped to reduce costs by keeping infrequently accessed data in less expensive “cold storage,” yet it also needed to be able to serve that information to customers quickly if requested. After closely evaluating several cloud vendors including Google, IBM, and Microsoft Azure, Hightail chose to go all-in with Amazon Web Services (AWS). Price was one key reason, as Amazon Simple Storage Service (Amazon S3) offered the lowest storage cost per GB. However, cost was only one of many benefits that contributed to Hightail’s decision. Among these was the rich ecosystem of partner solutions available on AWS. “All the other vendors we depend on for services such as previewing images, encoding videos, and serving up PowerPoint presentations are also on AWS,” says Paranandi. “If we went with a different vendor, it would have meant moving a lot of bytes for each user interaction. The same goes for the tools we use to keep track of our own system. Going with AWS actually made things easier and, in many cases, gave us better functionality than what we were using in house.” The migration was smooth and fast using AWS Direct Connect. Security and compliance were also important considerations. “Data sovereignty and security are concerns for our customers,” says Paranandi. “We can share with them how we keep the data secure in AWS, and how it enables us to maintain SOC II compliance.” The company is also beginning to use AWS Key Management Service (AWS KMS) for data encryption both in transit and at rest. 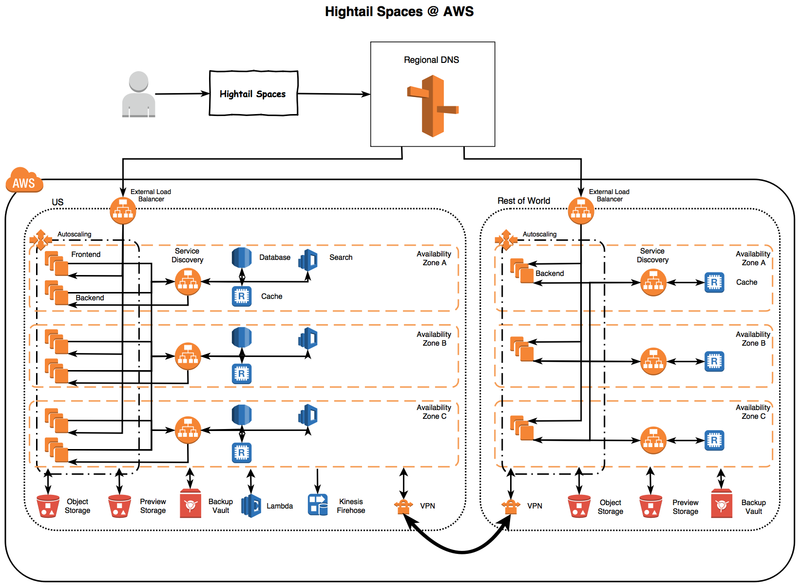 Hightail performed extensive testing before flipping users over to the AWS solution. “We did a lot of internal testing to ensure zero user impact, such as making sure that checksums between our data center and the data that got pushed to AWS were the same.” says Paranandi. Hightail has also found that training its internal team to work with AWS was a straightforward process using Amazon conferences, training materials, and support. “It was easy to develop the talent we needed in house,” says Paranandi. See Hightail architecture diagram below. AWS has also greatly improved the Hightail customer experience. “Reliability, performance, and uptime are extremely critical in our line of business,” says Paranandi. “Using AWS, our upload and download speeds are up to 17 times faster compared to our old data centers, and our uptime has increased by orders of magnitude.” The company can also replicate data at the bucket level across regions easily for disaster recovery purposes. Overall, Hightail has achieved its key strategic goal of focusing more on development and less on infrastructure. The company has successfully divided its storage infrastructure into frequently and infrequently accessed data to cut costs. “Tiered storage in Amazon S3 is a huge advantage,” says Paranandi. “Before, everything was active, and we were paying the same rates for all our data. Using AWS, our costs are optimized so we have more to invest in business growth.” Data can be moved from inactive to active tiers instantly to meet customer needs. Automatic scaling of services during peak load times means the company no longer needs to overprovision storage infrastructure. “The biggest advantage we have with Amazon S3 is that we are only paying as we are using it,” says Paranandi. Learn more about tiered data storage with Amazon S3.